Squash House Quilts: Dreaming of Summer Give-Away! I can't tell you how much I appreciate how you've stuck with me during the past few months of moving to the Squash House! Your friendship and generosity has meant so much! Mr. Squash and I are beginning to see light at the end of the tunnel in getting the house put together. We're also already dreaming of the summer to come - fly fishing, gardening, and being in the great outdoors in our area! So I thought I would show my appreciation by having a "Dreaming of Summer Give-Away"! Please leave a comment telling me what your summer vacation plans are! I'll pick three winners - at random - on Friday, January 29th. 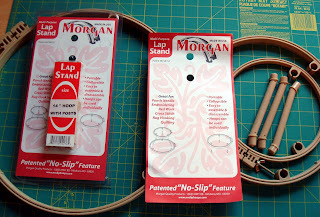 The first winner will receive these Morgan lap quilting stands! On the right is the 7/10 frame setup. Two hoops are separated by legs to make a unique stand for all your needlework projects. They raise your work to reduce neck and shoulder strain and give you the choice of two hoop sizes at the same time. The 14 inch add-on at the left comes with legs to attach to the 10 inch hoop. These are great for all of your quilting, rug punching or needlework projects! 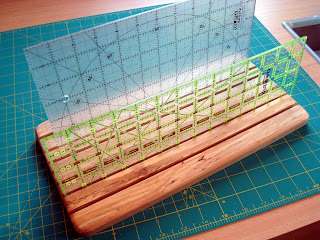 The second winner will receive this table-top ruler holder! (Rulers are not included). I own two of these and they're great for all sizes of rulers from your large 24" rulers, down to your little 4 " square rulers! I keep one loaded with my favorite rulers on top of my cutting table at all times! 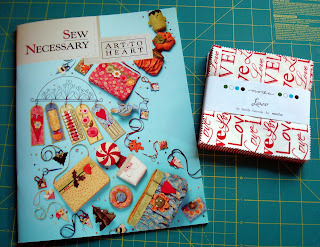 The third winner will receive this Sew Necessary "Art To Heart" project book and a charm pack of L'Amour by Sandy Gervais for Moda! The book has all kinds of fun small projects to help organize your sewing area - pin cushions, thread holders, scissor fobs, needle holders, etc! And of course Valentine's Day is nearing and who doesn't love some fun Valentine's fabric? Most of you know that there is always a little something extra included with my giveaways! I do ask that if you post anonymously, that you include an email address so I can contact you if you're a winner...this is a MUST for you to qualify. I can't wait to hear what you'll all be doing this summer! Good luck! I am going to England this summer to visit my daughter. She moved there 10 years ago when she married the man of her dreams. I miss her very much and am excited that i'm going over to see her again. We don't have any summer vacation plans as of now...and to be perfectly honest, I don't think we'll be going anywhere. We just got back from a few days in California. Hopefully we will squeek out a couple long weekends. I sometimes like them just as good. I'd love to tell you that I have huge travel plans - taking a cruise around the world; a train across Europe; flying in a hot air balloon across the Napa Valley but we're just not travelers. :-) My ideal vacation would be to rent a cabin in a cooler area (see, it's hotter than blue blazes on the Surface of the Sun in the Summer)for approx a month and just sew, sew and sew. That would be blissful. Summer vacation usually is a staycation for us. We love to stay home on our rural property and relax. When you commute long distance to work it's a pleasure to park the car. Thanks for a chance in your generous giveaway. My name is Elaine and I am new to blogging. I been having some difficulty with linking to other sites. I love quilting and I love meeting and hearing from quilters. I have many UFO projects and my goal is to try to finish some. I would like to enter the dreaming summer give-away. I am on an limited income and don't have any plans. My summer vacation includes my sister and her family moving home from Europe. She and I attending the Gilbert & Sullivan show instead of me dragging a reluctant DH. We hope to get out to the lake for a bit of fishing and camping. And sitting and looking at the water. That's the most important part! Having a farm, we don't go anywhere in the summer time as we are needed here, but we do plan lots of bonfires and picnics either on the hill or down by the river. THe Kids love roasting hotdogs over an open fire and then there are smores! We sometimes will take a long weekend to visit some of the grandkids, but more often then not, they come to us in the summer! Well, you have certainly picked some great items to give away! I'll give it a try. As you know, we will be going to Sunriver, Oregon for 9 nights, kids included. We missed it last year. I was thinking that I would go fishing! I was invited afterall!! Hee! So pleased that you and Mr Squash are nearing the end of all the improvements and will have time for yourselves and one another. No plans for a US summer holiday, but dh and I plan on taking an Aussie summer holiday. We're hoping we can fit it in around my dd's cruise that she's had planed for ages. So hopefully this Christmas or early new year we plan on being in Australia in one of the hottest months. Such a generous giveaway Candace. Love reading your blog! We don't have any plans as yet but we will probably go away someplace within driving distance for a week. The rest of the summer we take occasional day trips to 6 Flags, etc. My husband & children like to go on the rides, I bring a book! Glad your house is coming along so nicely. This summer we are going to the Palouse area of Eastern WA to watch the wild horses run. It has been a dream of mine for years - to see wild horses running free - and this next summer is our time to go. Such a sweet gift! Thank you! I will be going up to Oklahoma with my parents and brother and his wife. We have a week of fishing and laying around! I'm learning to fly fish this year! We haven't really decided what we will be doing this summer. Usually we hang out at the beach alot and take a short 4 day trip. This year I really would like to go to Solvang for a couple of days and maybe camping. We haven't finalized summer plans yet, but hoping for a week in the mountains and a week in Southern California...I love the beach and didn't get there last year...hopefully this summer! We will be hiking at lake O'hara in B.C. It is beside the Alberta border. It is the most beautiful spot (to me) that I have seen in the Rockies. We're headed to the Twin Cities for a family vacation/wedding. It should be lots of fun. I love the L'Amour charm pack! It's one of my favorite lines this year. Wow, what a great giveaway! We haven't even begun to think of summer yet, though we are planning a trip to the beach in March, hopefully. Since we are empty-nesters, we don't see summer as the only time to get away. Also, we should have 2 more credit cards paid off by summer (good Lord willing and the creeks don't rise), so maybe we'll think about a fall getaway to somewhere nice. Have enjoyed following your blog and the renovations and move to Squash House. Some good ideas there! No plans for this summer yet as we went to Alaska salmon fishing last summer. As we are retired, our travels tend to be more off season. I am dreaming of the garden I will have this summer in my new yard and of going to farmers markets and meeting my new neighbors. Candace, I want to throw in there that I also TRULY enjoyed when you shared your story of Mr. Squash and your wedding. I hope many read it because it was a story worth taking the time. We have one big summer vacation already planned. We are RVing up to and around Oregon (I think you know the area...LOL) We're looking at approximately "around" the tenth of July. Hubby even says we can be in Sisters, Oregon for their big quilt show on the tenth. Now that's a nice hubby - and get this - HE suggested Sisters on the tenth because he's heard me talk of it so many years. He had looked up the dates even BEFORE I knew the exact date this year. We live near Prescott, AZ so it'll be a substantial RV trip - and one I look forward to. And yes, we take the three Weimaraners with us whenever we do a jaunt. Oh we'll take other RV trips this summer but the Oregon one is our BIG trip this year. Last year we went to Yellowstone. our plans are pretty much the same as the last twenty or so years!! Yes, you were missed yet I knew where you were and that you were coming back - the most important of them all!!! This summer does seem so far away because of the comings and goings before then. Yet, I know that it will be full of the outdoors, backyard variety. Gardening and canning. July brings grandchildren from the East coast and we are preparing a plot for them to have in the garden with something growing for them ready to harvest and room for them to plant seeds too. Oh my goodness what a very sweet giveaway! We don't have summer plans right now, but we may be heading to the slopes for some snowboarding (them not me :-) Thanks for entering me in your giveaway. The frame is awesome and the charm pack and book look like great small projects. Wow what a great giveaway! Don't have any summer vacation plans as of yet. May be just relaxing around the pool. This summer we will attend a family reunion in Colorado in July then head east and wait out the hurricane season. If there are none this year like last, I plan on sewing to my hearts content!! But, I plan on taking the Bernina 730 instead of the 430 so I can embroider on my quilts!! We just made the campsite reservations this morning. The phone lines opened at 9 a.m. and someone, no me, got through and have booked a group campsite that is out of this world. Private beach, lots of room, big covered firepit....whoohoo. I missed camping last year, had lumpectomy instead! We were going to travel to Alaska for the wedding of our middle daughter, Cassie. But she and her fiance, Chris, have decided that the economy isn't good enough for them to save enough money for the wedding of her dreams and for all of their family to travel. I am just going to enjoy the 3-day weekends I get each week in the summer. I am going to spend time in my little garden, making it better. I am going to craft. I am going to hit the thrift stores and yard sales in my town and just slow down and enjoy life. We have no vacation plans for the Summer at the moment. I expect we will have the odd few days in the Lakes. This half term we will go back home to Oxfordshire for a couple of days. Wow, vacation plans? We're probaly going to drive our two kids from CA to South Central Oregon to visit their almost grandparents. Well, that's the dream, it's a loooong drive - last year it took us about 12 hours one way. What a great giveaway, Candace, everything is just what a quilter/stitcher REALLY needs! I am hoping to get away for a few days this summer to Pismo Beach with my DH. We have not been on vacation together alone for more than seven years! Well, since this is our 25th wedding anniversary, we are either going up to Canada, not sure where yet or a tour of the National Parks in the Western US. Please enter me in your drawing! Summer seems so far ahead, but we have already booked the same cottage in eastern Finland as many years before, and will spend our whole holiday of 4 days there, flyfishing and enjoying the nature. - Amazing prizes to win! WOW...what a generous giveaway. We are in the midst of making plans from my SO's(significant other) parents 50th anniversary. Their request is no BIG party, just their 3 kids, spouse or SO's, and the grandchildren. Everyone is throwing in their 2 cents worth. "Our idea" for what it is worth is to "trap" the families on a house boat on Lake Powell (Arizona & Utah borders) for an extended weekend. Very relaxing and a good "get away" from it all kind of place! What a great giveaway! I've enjoyed following you and Mr. Squsah on your journey! We plan to take the kids somewhere to look for fossils and sharks teeth! They love digging and finding all sorts of "things" in stone. Only plans so far include a trip to Canada to see our daughter, some day trips, family reunion and the usual enjoying time in the flower garden. My summer is going to be wonderful. I am going to Chicago to visit relatives and I am going to be a grandma in July, so that will be the highlight of the summer. And I'll get to spoil the baby because they live close enough to visit often!! We hope to spend some time at the beach, hopefully Destin or somewhere on the gulf coast. How sweet of you Candace to have this great give away!! This summer I will be hugging!!! Yes, hugging. My first grandbaby will be born in May and my only daughter is moving back to Minnesota after living way too far away for the past eleven years...so I will be hugging my grandbaby and my daughter this summer!! Hope your summer in your new home is wonderful. I think it is good sign you are already dreaming of summer...me too! And how fun to have a giveaway thinking about summer. Count me in! What a wonderful giveaway...all perfect for our indoor winter activities (stitching, sewing and organizing..) If my husband's health permits, we hope to get to the Beach at least once. A 10 hour drive, but one that both calms and re-energizes me. Always come home with a fresh perspective on life! If we can't go, then we enjoy the summer sitting on our porch watching the birds and we do a lot of fishing! Can I participate?, I'd love to be entered, but I'm not in the US, so I don't really know for sure, I love the goodies you're giving away, I really would love to win!, well, we're in summer right now, it's going to be with us until early May. I'm going to go to the beach for Valentine's, and I'll spend the weekend there, can't wait for it! What a great give away. Our summer is going to be low key, this year. Lots of time with the grandkids, one of my daughters is flying in for my hubs 70th. It'll be great. Love the getaway--the only thing that looks like summer here is seed catalogs. We have about 3' of snow in the front yard and expect more tomorrow. I could sure use a few dreams of balmier days. Great giveaways! This summer we plan to go two weeks in Canada to visit some relatives. Thanks for the chance! I am planning on traveling to Va for the birth of my #2 grandchild. Since Daughter had #1 grandchild in July 2009, I figure she might find me useful..LOL! She told me she wanted to get all of the 'having baby stuff' done early and get it out of the way, I see she intends to keep her word on that since we are getting 2 in one year! Until then I plan to quilt my fool head off..isn't it wonderful to be retired? My summer plans: Once again my plans are to stay close to home and work in my gardens. Each year I take a spot around the house and transform it into a lush garden area. Last year was a pond in front of my husband's barn style workshop. Summer seems very far away, but I know I'm going on a road trip with my three great guys in our VW camper, and along the way we'll bike and cook outside and maybe even stop at a quilt shop. Thanks for a chance at your giveaway. Of course we'd stick by you! You're such a sweet heart and a treasure. I love what you're giving away, too. Just wanted to say that. My friend, no summer vacation plans here. Not this year. ...foiled again. It's been inspiring watching you get settled into your new home. My family and I just moved to Wyoming from Arkansas. We are also settling in. Thank you for sharing and thank you for the goodies!! Wowee!!! what a giveaway you are having. You know we have not even talked about summer vacation this year. We will probably just take weekend trips since we had a big vacation last summer to the Outer Banks. Summer vacations? I fear, that will happen without me, again...but I really hope to get at least one weekend to the sea...Baltic Sea that is...of course it's never warm enough here in Germany (at least when I'm not at work...sun always shine when we can't enjoy it, doesn't it?) but walking at the beach, enjoying the breeze,...oh I wish I was already there...! No summer plans, but i am preparing for 2 weddings, my nephews and my daughters are both getting married within a month of each other and my sister is going to have a baby and my other niece is getting married at the end of this year, very very busy! Our summer plans include a trip to Yellowstone with my mom (her first time), and I'm also heading to CA for a rug hooking camp - WooHoo! Of course, we'll do some camping with the family and some 4-wheeling, and some boating. Might even fit in an Alaskan cruise to celebrate our 30th anniversary! I'm afraid my summer plans include getting prepared for an empty nest when my son goes off to college. Thanks for the chance! AMazing give away, thank you for the opportunity to enter. I don't have any plans for summer vacation yet... I will probably be taking graduate classes so I won't be able to go to far. Maybe day trips to the lakes or mountains. No real plans yet, but I know it will include at least one trip to Seattle, one Ferry ride and probably a few short day trips to other places around Washington we haven't been to yet. Any suggestions? How sweet of you Candace. I think moving is one of the hardest things to do. And you've really held up. Good for you and Mr. Squash House. I'm dreaming of spring! I'm going to St. George for a little half week retreat with nedra of cactus needle and kim of bitty bits and pieces and Lori Holt of bee in my bonnet fame. It is warmer there and it will be nice. But this summer I'm teaching a retreat in south central utah and going to Star Valley Wyoming to my sister's ranch! oh I'm excited thinking about all of it. My son will get to fish, which he loves. Love the items you're giving away!! !, love to be entered in the drawing!, we're in summer right now, it's very hot here, so we use to visit the beach and swimming pools often to refresh us! Thank you for the nice give away. Moving Again and 3 Winners! Fall Finish and More Baking!